This is indeed meaningful to me… a 2-month old newbie in the world of blogging. 1. I have an insatiable need to speak my mind, so blogging is my way of not making a nuisance of myself. 2. I am unconventional (I’d like to think so but most probably not? ). 3. I don’t like to see suffering. 4. I can’t live without music. 5. I can’t live without books. 6. I dream of a cottage by the sea where I will spend my days writing and watching/listening to the waves. 8. I also believe each of us has choice in how we respond. 9. “Solitude and quiet” is my refuge. 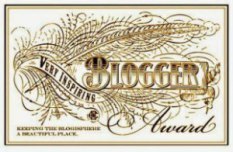 Thank you so much for honoring my blog in this way!